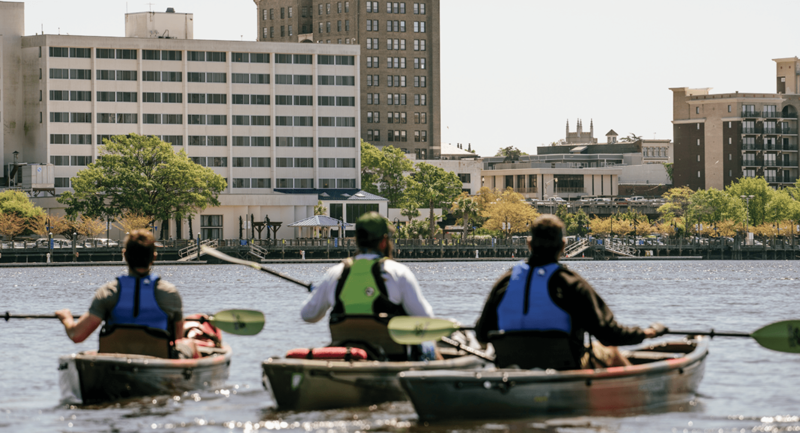 … After 170 miles of paddling, downtown Wilmington appears at the confluence of the Cape Fear and Northeast Cape Fear rivers. We ducked underneath a railroad bridge at Navassa as a large sightseeing boat was bearing down on us. “We love you, Kemp!” screamed a dozen women and girls onboard. Kemp shook his head and smiled. The captain was a friend of his, Kemp said. He wasn’t really that popular. At 11:30, we paddled underneath another highway bridge at the mouth of the Northeast Cape Fear River, and suddenly we were downtown, passing a Coast Guard cutter and the Battleship North Carolina, waterfront parks, buildings, fountains, and cars. Men and women eating lunch at riverside restaurants watched us take stroke after stroke. Joggers glanced at us. Dogs sniffed in our direction. We sat up straight, and stuck out our chests. We paddled toward Dram Tree Park like runners entering a stadium at the end of a grueling marathon. As we walked, one of the onlookers stopped me. “How was the trip?” she asked. It was like having a new job, I said. A good job. I got up in the morning, and got to work paddling. At the end of the day, I had dinner, relaxed, and went to bed. The next morning, I got up and did it again. It was simple. As simple as I dreamed it could be. And with that, on the seventh day, we rested. The last day of paddling was an afterthought. We had 26 miles to go, and the wind was at our backs, with a falling tide to push us. We’d reach the river’s end by lunchtime. We left Dram Tree Park at 5:30 a.m. with light boats, carrying just some water and snacks. We paddled into the blackness of the 42-foot-deep shipping channel and quickly encountered a container ship, the Maersk Wakayama, being guided by a tugboat to the mile-long State Port just south of downtown. We gave it a wide berth. The ship was almost the size of two football fields and its captain likely couldn’t see us. The Cape Fear River was now an estuary, and as its water dried on our coats, it left behind a salty residue. The channel was a mile wide. We passed Island 13, a splinter of land bulked up by sand and dirt dredged from the riverbed. Ahead, the water disappeared into the horizon, under a blue sky flecked with high, pink clouds. Pelicans, ibis, and seagulls circled above us. 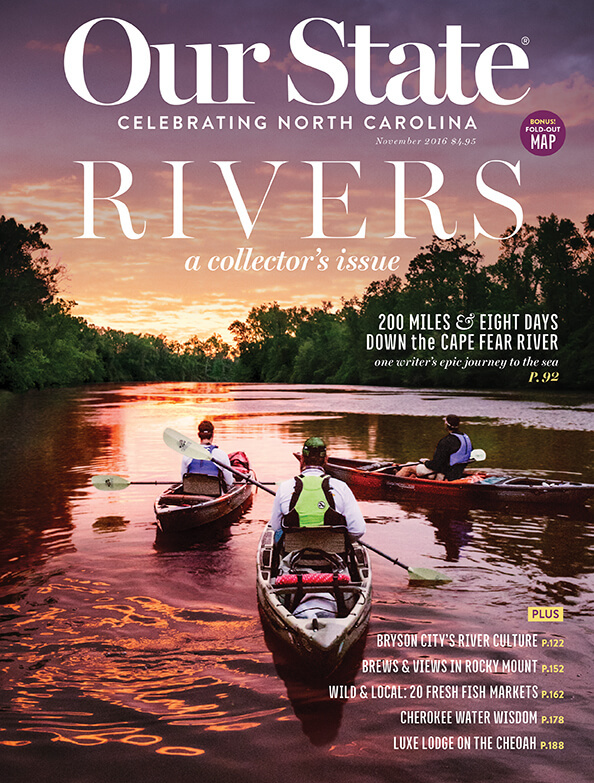 View images and read the full story of paddling 200 miles down the Cape Fear River at Our State Magazine.